I believe in the idea that giving back starts with just one thought, one person, one act of kindness. I’ve made this concept a part of my personal life, and it only made sense to make it a part of my company’s culture, too. Of course, starting a company initiative to give back is much different than simply making your own decision to personally donate to a charity. But company charity work can have a huge positive impact, making it more than worthwhile for you and your employees. Creating a positive perception of your company can attract a diverse group of job applicants. While millennials probably don’t account for your entire workforce, it’s important to understand the way our newest and youngest employees perceive the value of a company. The 2014 Millennial Impact Report found that the third most important consideration for millennials ages 20 to 35 when deciding where to apply was the company’s involvement with charitable causes, right after they considered what that company does, sells, or produces and the company’s culture. Company giving can also boost your current employees’ morale and engagement. A 2015 study showed that corporate philanthropy inspired positive employee attitudes throughout the year. Along with keeping your employees motivated, charity can also establish trust and respect for your company. And that trust and respect doesn’t end once you leave the corporate campus. Working closely with local charities and helping them improve your community can also put your company in the good graces of residents in the town or city you’re located in, too. Set out a bin for new or gently-used clothing — Encourage your employees to donate their old clothes instead of tossing them out. Give them the option of donating new items if they choose to. Keep in mind the seasons in your area or check with a local charity to see what they need most, then theme your donations around that. For example, every winter, Experticity, my company, sets out a bin for coat and blanket donations. Or theme your donations around specific needs. Organizations like Dress for Success, which gathers donations of work apparel for women in need, give your employees a chance to support a cause that speaks to them the most. Once you’ve collected donations, you can ask the Salvation Army to come pick them up for free — or let your employees take action by delivering your donations to a drop-off location. Become a mentor for local kids — Big Brothers Big Sisters offers a Workplace Mentoring Program where students can learn from one-on-one mentorships with your employees. This is the perfect way to give back without having to leave the office, but the impact can still be just as great. Let your employees create a learning program for the student they’ll be mentoring, and don’t forget to set aside time for them to relax and bond together over lunch or a fun project, too. Put food on the table for others — Host a food drive and invite employees to donate non-perishable items. For a list of suggested foods, check with your local food banks to see what they need the most. If your teams are up for a little bit of friendly competition, you can get everyone motivated by offering a pizza party or other prize to the team that donates the most. Fundraisers are another great way to give back to your local food bank and other charities. They’re also a perfect opportunity for your employees to show off hidden (or not-so-hidden) talents. 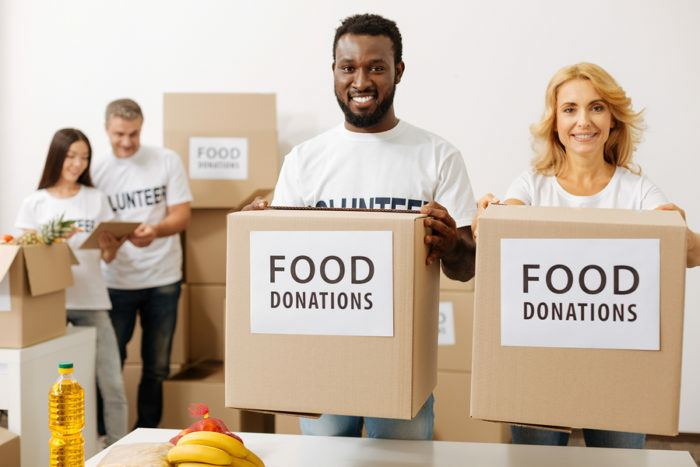 Feeding America and No Kid Hungry have lots of ideas for ways employees can use their talents to raise money, including bake sales, races and athletic events, and more. Support local animal shelter and rescue organizations — This is a great way to tailor your company’s giving to what your employees are most passionate about. If your office is full of pet lovers (whose isn’t? ), why not put out a bin to collect new and gently-used pet items. These could be blankets, leashes and collars, toys, grooming tools, water and food bowls, and food. Contact your local pet shelter or rescue organization to find out what they need the most. You could also let your office or teams choose an animal to sponsor. Best Friends has a list of dogs, cats, and other animals in need to choose from, and each one comes with a unique story that tugs at your heartstrings. Make the holidays special for families in need. Ask your employees to gather up new toys and make a special trip to take them to a Toys for Tots drop-off location. You can also adopt a family as an office, or allow teams to adopt families and gather their wish list items together. Organizations like the Touch a Heart Foundation and Soldier’s Angels (for adopting military families and deployed military members) make it easy to find a family to adopt. Gather together and donate toward disaster relief. This past year has seen one too many natural disasters, and if your employees feel the urge to donate toward disaster relief, they’re not alone. You can find a top-rated charity by checking Charity Navigator and searching for the charity theme or event you’d like to support, then set up a crowdfunding campaign to allow employees to donate to the cause. You can even step things up by offering an employer match for each donation made. Other causes include hosting a blood drive through the American Red Cross. After the events in Las Vegas this October, several Experticity employees got together and carpooled to a blood donation center, some made sure snacks and care were provided for the donors, and we’re hosting a blood drive at our offices. It’s not hard to get your employees into the spirit of giving at any time of the year, and the positive impact charity has on your employees’ morale and local community can be profound. Start out small and try one of these ideas, or get your employees together to brainstorm your own way to give back. Whatever you choose, I encourage you to just start. Do you have a unique way your company gives back? Share it with me in the comments. Heather began her career managing mergers and acquisitions at a large investment bank in New York City, and had a successful career in private equity for various firms in Boston, Wyoming and Salt Lake City before joining Experticity. Today she leads talent acquisition and development, finance and corporate development for Experticity. Heather can be reached at Heather.Mercier@Experticity.com.